This week, Drakes Brewing Marketing Director Kelsey Williams took to the online air to sing the praises of collaboration beers, so when the guys from Mikkeller dropped us a line to ask about a brewday during SF Beer Week, we were definitely interested in what we could make together. 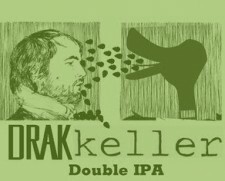 It’s in that spirit that we’re happy to announce Drakkeller Double IPA – a DIPA made here at Drake’s in conjunction with gypsy brewers emeritus Mikkeller, based in Denmark. Some of you may remember Mikkeller’s first foray into San Leandro, 2011’s Invasion IPA. If you missed out on that, you’re getting a second chance. After some discussion between Mikkel Borg Bjergsø, Thomas Schøn and our brewmaster John Gillooly, we ended up taking the best of both worlds and brew a double IPA dry-hopped exclusively with a “stupid amount of” a new experimental hop from Washington’s Yakima Valley, Azacca. It’s a new hop that’s already exciting brewers all up & down the West Coast, with heavy notes of citrus & tangerine, along with pine and apple. (Pictured: Drake’s brewer Michael Boals and Thomas Schøn on the brewdeck).